"Directly opposite Minster Court with a lovely outside seating area and floor to ceiling windows, this wine bar has a light, contemporary feel. A spacious bar, elegant private rooms and a large dining area with its own dedicated bar are well suited for private events and meetings. 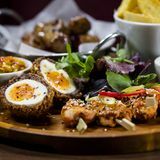 Our menus are created with fresh, seasonal produce and drinks include craft beers and premium spirits as well our extensive wine list from Davy’s wine merchants, including rare vintages and many wines by the glass." What did you think of Davy's at Plantation Place? Davys at Plantation Place is a good place for a hearty autumn meal. Their roast chicken is particularly good and the staff know what they are doing. The Davys wine is always top knotch as well. Davys at Plantation is a safe and tasty option. Hmm, I like the interior of Davy's true but it's a Davy's so...do I really need to say much more? Davys at Plantation Place is a cosy, wine-lover’s oasis among the huge imposing buildings of the city. Sitting like a tiny, bright haven opposite the imposing grandeur of Minster Court, Davys at Plantation Place has a look and atmosphere that exudes superior quality and superb service. The half-frosted floor-to-ceiling glass windows that surround the exterior allow a friendly, clear view, and once inside you don’t forget where you are. A small strip of chrome chairs and tables outside are roped off, maintaining the theme of quality and comfort. Wooden floors, low lighting and a wine-adorned back bar stacked with pristine, sparkling glasses leave you in no doubt that you have entered a superb-quality wine bar. This is further reiterated by the crates of wine stacked up in one corner and the vintage Champagne display. Leather upholstered booths with coat hooks line the windows and upright tables and chairs are dotted around the rest of the room, giving you ample seating choice. Fresh flowers prettify the bar and the staff clearly take as much pride in their appearance as they do in the bar itself. Through the bar you will find the cosy restaurant, with an airy main seating area and four private dining rooms for more intimate meetings. 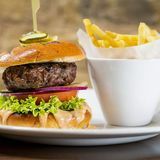 Busiest at lunchtimes and after office hours, Davys at Plantation Place has a good-natured and sometimes raucous hubbub of city workers rewarding themselves with a speedy lunch or a meal and drink before they make their way home. Subtle jazz plays in the background. Knowledgeable and attentive staff will help you choose from the menu, whether you’re in at lunchtime for a hot or cold sandwich, the 30 minute express lunch, or you’re there in the evening for the full dinner menu. The simple food selection has clearly allowed the chef to perfect the dishes. Recommended starters are the chicken liver pate teamed perfectly with sweet, sticky onion marmalade, and the smoked salmon – brought to life with pink peppercorns. 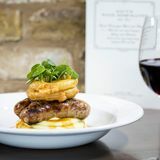 Safe main courses include Caesar salad, bangers and mash and – the waiter’s recommendation – the calves’ liver with Suffolk back bacon, accompanied by the smoothest, creamiest melt in the mouth mash and strong onion gravy. Wines are, of course, in abundance with full descriptions and suitable occasions for each. Fine wines include a Cloudy Bay and Chambolle Musigny, plus several vintage champagnes, all at realistic prices. Davys at Plantation Place even has the Davys own lines, including a Muscadet, Pino Grigio and a White Burgundy. The Australian Semillon – pudding wine – is a delightful accompaniment to the treacle tart, and the smooth, strong Chilean Carmenere will leave your taste buds tingling for more. A friendly wine bar to suit the casual drinker and the connoisseur alike, with a simple but reliable menu to leave you 100% satisfied.